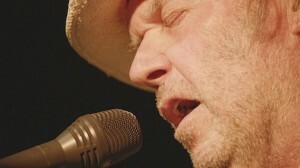 I have just one question: Who the f*ck doesn’t love Neil Young? 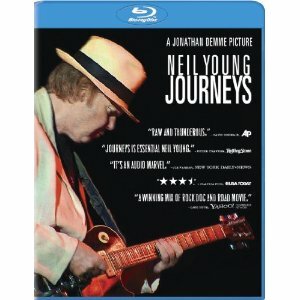 The ‘Grandaddy of Grunge’ has been on quite a roll over the last few years, musically and artistically, releasing several critically acclaimed albums, an autobiography (finally), not to mention releasing the long, long-awaited “Neil Young Archives: Volume 1” to the masses, proving again and again that ‘rust never sleeps.’ After all, Young is pretty old for a rock and roll star. However, his love for making music and shredding guitars on stage never ceases to wane, as is evident in his latest concert documentary film, “Journeys,” from Shakey Pictures and Sony Pictures Classics. As he cruises around some of the back country parts of his childhood home with brother Bob, Young sheds some humorous light on growing up, as well as taking a stroll down memory lane through the ghosts of buildings and structures no longer standing in Omemee. Much of these elements naturally make their way into Young’s music, hitting every sense from every direction, in a playful, old timer reminiscing kind of tone. The most visually striking parts of Demme’s documentary are the up close and personal shots of Young’s spitting mouth, as he vocally blasts several songs in a very uncomfortable, yet intriguing manner. Young and Demme also visually pay tribute to the ‘Kent State Four’ in the classic, “Ohio,” the four college students who were killed during protests at Kent State University in 1970, through a blend of Young’s explosive solo performance coupled with archive footage and photos of the Kent State victims. What is still amazing about Young and his masterful performances of this new and classic material, he manages to fill the stage and atmosphere with the sound of a full band, though he is but one man on stage, taking on lead and rhythm guitar distortions simultaneously. And, though Young certainly shows his visual age in this film, his songs and messages are as youthful and powerful as anything he’s recorded over the last 40+ years. The feature was filmed in 1080p High Definition/1.78:1 video throughout, as well as mastered in high def, which is quite evident in the specific close-up scenes of Young’s spit hitting the camera during his performance. You can even see the wear and tear of Young’s 40+ year old Gibson guitar, which has seem many miles during its lifetime. Color tone and contrast in the concert film portions are what you’d expect; stark contrast and vivid blasts of color blanketing the stage set, which looks spectacular in high def, as though you are in the audience yourself. As for audio, Young and Demme don’t cheap out here, as Young especially is a high quality audio nut. The film is mastered in 5.1 DTS-HD MA with subtitles in English, English SDH and French. Turned up loud enough, you’ll need ear plugs to save those dainty little ear drums. (I know I did watching the film for the second and third time around. I probably could have just turned the volume down, though…) The audio for the conversational parts of Young driving are your basic ‘talk into the camera’ audio quality, which is neither good nor bad, but decent enough to hear and understand what Young is saying. His jokes and stories are pretty damn funny. I was hoping the film would have some good extras included, and I wasn’t disappointed. “Journey To Slamdance” is a great conversation with Young and director Demme at the Slamdance Film Festival, on how the idea behind the film came to be, as well as how the two came to end up working together. The additional behind the scenes conversation with Young and Demme with 92Y also yields some interesting tidbits about the documentary, as well as shedding some light on Young’s preference (and possibly disgust) with current digital age audio capabilities. He even talks a little bit about his own brand of audio mastering called ‘Pono’ (which supposedly will debut sometime in 2013) that will serve as a rival to Apple’s iTunes and MP3 audio formats. And…if you ever wanted to know why Young took so long to release the first volume of his ‘Archives’ series, he sheds some light there, too. Additionally, no documentary isn’t complete without the ‘making of’ portion, which you get that here, too, including a few extra scenes with Young, brother Bob and Demme. This entry was posted on Saturday, January 5th, 2013 at 4:52 pm	and is filed under Film, Music, Reviews, Uncategorized. You can follow any responses to this entry through the RSS 2.0 feed. You can skip to the end and leave a response. Pinging is currently not allowed.